Caulfield, a residential area with a prominent metropolitan racecourse, is on Dandenong Road, 10 km from central Melbourne. In addition to the suburb of Caulfield, there are also the suburbs of Caulfield North, South and East. Until about 1990 Caulfield East also included the area bounded by Waverley, Belgrave and Dandenong Roads, but that is now part of Malvern East. The origin of the name is uncertain, although John Caulfield, a builder who arrived in Melbourne in 1837, has been suggested as a source. 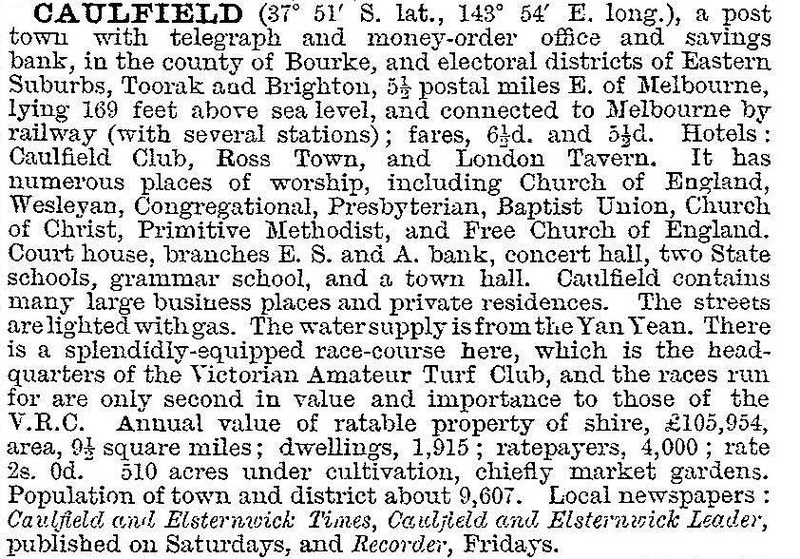 The name Caulfield was in use on maps around 1857, generally in the vicinity of the present racecourse. 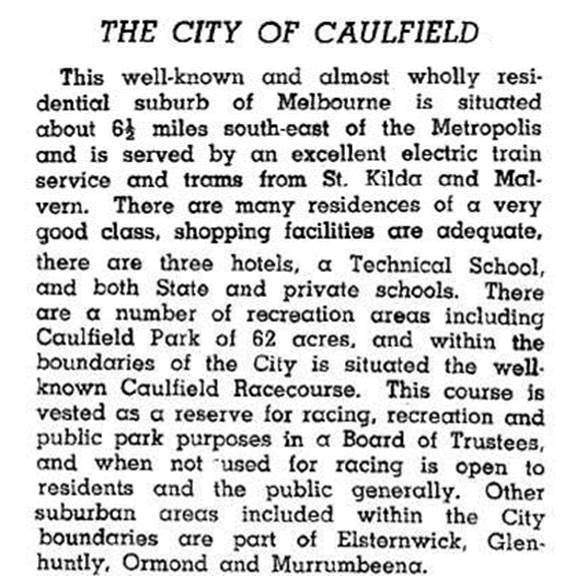 The 1870s saw considerable development of Caulfield. The Roads District became a shire on 17 April 1871, and the Caulfield railway station was built in 1879 as part of the South Yarra to Oakleigh to Gippsland line. Two years later the Caulfield to Mordialloc line was opened. While this construction activity was under way an entrepreneur William Ross proposed the building of another line across the south of Caulfield shire, from Oakleigh to Elsternwick. It was associated with the Ross sugar beet factory, using sugar beet grown in Gippsland. The line did not open until the late 1880s, but failed during the Depression in the following decade. Its route is traceable on present-day street maps along Oakleigh Road and a linear park which is a prolongation of the road. On 4 May 1901, the district's urbanisation was acknowledged by the shire becoming a borough, which became a town on 26 September of that year. The Caulfield municipality acquired separate suburbs, and the Caulfield township was in the north. The northern municipal boundary followed Dandenong Road, and the railway station and racecourse were quite close to it. Caulfield's northern boundary is just south of an escarpment more or less followed by Dandenong Road. North of the escarpment is hilly, more elevated land than the land on which the municipality is situated. There were several swamps in Caulfield, one being just west of the racecourse and the low-lying land was blamed for water-borne diseases. Sewering was a major concern in the 1890s, to replace cess pits, along with water reticulation. By 1914 reticulated water was available on most new housing estates. Several swampy or low-lying areas became parklands. Paddy's Swamp from which peat and sand were extracted in the 1860s and 1870s, became Caulfield Park, the main sports area in Caulfield near the racecourse. On 16 April 1913, the part of Caulfield municipality between Poath and Warrigal Roads was annexed to Oakleigh borough. Caulfield's suburban boundaries are Kooyong, Glen Eira, Booran and Glen Huntly Roads. It has the Hawthorn Road and Glen Huntly Road tramlines (1913). The tram intersection is a grand union junction (1913) where tram cars can turn right or left from all four directions. The junction is heritage-listed. The town hall at the corner of Hawthorn and Glen Eira Roads dates from 1885. The main hall and portico underwent a major remodelling in 1931 as part of a local employment scheme during the Great Depression, and an arts complex was added in 1988. The Caulfield Library opened there in 1993 and Glen Eira city council is headquartered there. Caulfield hospital is in Kooyong Road. The site was originally the Glen Eira mansion (c1880-1964) and was a World War I military hospital. Caulfield East's suburban boundaries are Dandenong, Grange, Neerim, Booran and Kambrook Roads. Half the area is taken by Caulfield Racecourse, stables and Glen Huntly Park. The area is served by railway and the Malvern East tram (1913). Caulfield railway station (1914) is heritage-listed. The Caulfield high school's building (1963) was at the south of the racecourse reserve and is now Glen Eira college. North of the railway is Monash University's Caulfield campus, formerly Caulfield technicial school. Caulfield North's suburban boundaries are Orrong, Wattletree, Dandenong, Kambrook and Glen Eira Roads. The area is served by three tram lines: Hawthorn Road (1913), Balaclava Road (1913) and the Glenferrie Road line which goes along Dandenong Road (1911). The first two tram lines meet at the corner of Caulfield Park, the district's largest and best appointed public reserve. Balaclava Road is also the address of an imposing brick Catholic church (1924), Caulfield Junior College (originally Caulfield North central school) (1916) and the former Presbyterian church, now the Indonesian Uniting church. The church (1926) was built for a new, fast growing parish and the heritage-listed design blends Gothic and Art Nouveau. To the west there is the Liebler Yavneh College (1962) and Melbourne Grammar School's junior campus (1918). Glen Eira Road is the address of Shelford Girls' School (1898) adjacent to St Mary's Anglican church (1871) and Jubilee Sunday school (1887), both heritage-listed. Caulfield North's grandest heritage building is the Labassa mansion (c1890) in Manor Grove. A short way north is another synagogue in Inkerman Road. Caulfield South's suburban boundaries are a rectangle, Kooyong, Glen Huntly, Booran and North Roads. It is served by Hawthorn and Glenhuntly Roads tramlines (1925, 1913). It has the Caulfield primary school (1864) but Caulfield South school's opening year, 1928, typified the suburb's interwar and early postwar growth. Its south-west corner has Brighton cemetery (1849), well distant from built-up streets for probably its first 80 years. Prince's Park is in the middle of Caulfield South. It has four ovals and is linked to a linear reserve which was the route of the Rosstown railway. Adjacent to the reserve there is Hillcrest Avenue, the address of A.V. Jennings first housing estate (1933). A short distance south there is a Jewish synagogue and kindergarten. Unlike the other Caulfield suburbs, Caulfield South has kept much of its detached house stock.